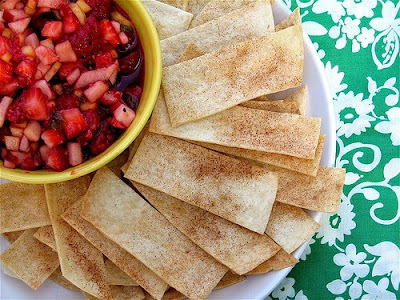 Making tempting snacks at home is a child’s play if it is as easy as preparing the tasty Fruit Salsa and Cinnamon Chips. Prepared in just 45 minutes, this snack item is one of the most popular snacks in western parties. Try out our tried and tested Fruit Salsa and Cinnamon Chips recipe and see how you tempt your tasting buds. · Mix kiwis, apples, raspberries, strawberries, white sugar, brown sugar and fruit preserves in a large bowl. Then, cover and chill it in the refrigerator for 10 to 15 minutes. · Preheat the oven at 350 degrees F.
· Take flour tortilla and coat one side of each tortilla with butter favored cooking spray. Now, cut into wedges and arrange a single layer on a large baking sheet. Then, sprinkle the wedges with cinnamon sugar and spray again with cooking spray. · Bake the prepared sheet in the preheated oven for 8 to 10 minutes. When done, cool it for 15 minutes and serve with chilled fruit mixture. nice recipe,i like it. save on shopping by using free printable coupons.